On Friday, January 28, 2011 Jean Gullo passed away. Although her health had been deteriorating over several years, she was lucid and loving until the end. Jean joined the TSA in 1953. She was fond of saying that the question she asked when joining the TS was "what do we do?" The issue of putting our studies and principles into action was to become a theme of her theosophical life. Shortly after joining Jean became active in a number of service activities at the Hollywood Besant Lodge in Los Angeles, promoting the work of the U.N and working with the Lakota Indians. She was strongly influenced by an early mentor, Lois Holmes, who at that time was president of the Theosophical Order of Service. An artist by training, Jean soon found herself head of the TOS department of Art and Music. 1966 was a crucial year for Jean. In that year a number of important events occurred, her first husband died; she went on the road as a national lecturer; she became president of the TOS, a position she would hold for the next 41 years; and perhaps most importantly, while presenting at the TSA annual meeting in Wheaton, IL she met her future husband, coworker, and the love of her life, Joe Gullo. 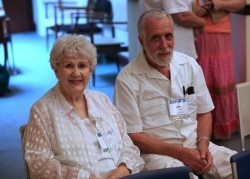 When Jean and Joe eventually married they became a team in every sense of the word, traveling around the country presenting talks and workshops on Theosophy and service. Together they developed the idea for a magazine and in 1982 the first issue of For the Love of Life went to press. From Jean's first days as a TSA member the Theosophical Order of Service became a focus for her energies. As president she was always innovating. She was a writer, speaker, administrator, fund raiser, motivator, and constant example of love in action. Jean will be missed by the many whose lives she has touched over the years.